I watched Empire the other night. Still an amazing film on an astonishing level. I just love all the character moments, especially aboard the lame Falcon! Did you spot any particular tweaks to New Hope? I meant to compare Obi Wan's entrance. It seemed to me like his shout to scare off the Sand People was enhanced. I liked it, because I'd got the volume ramped up and it seemed so harsh, you could imagine them being scared! Still can't believe that if they're tweaking anything, a moment of dialogue looping for Vader is still untouched. Watch the second scene where he's telling Tarkin that he knows Obi Wan is aboard. There's a brief moment where his hands are moving as if he is still talking, but... he's not. Did you spot any particular tweaks to New Hope? I meant to compare Obi Wan's entrance. It seemed to me like his shout to scare off the Sand People was enhanced. Yes that was one bit that was different, not too sure it worked for me but then again I viewed this late evening so the volume was down. Another minor change I think I spotted was that Greedo and Han now seem to fire simultaneously in the cantina. Not too sure that I saw any others that were new amendments to this version of the film. Yes I wondered if the ' shot first' had been tightened up and I think it has been, but it was already pretty tight on the dvd when I checked. I seem to remember a small compromise had been made following the controversy during the cinema release. Just watched Jedi. It's impressive, but the image is inconsistent. Tatooine is much better than in New Hope, but Endor isn't as eye popping as I thought it would be. It's still light years ahead of the DVD though. There is one small tweak to Jedi, which you may have heard about already. It's completely unnecessary, beyond an attempt to mirror a similar [much derided] thing in Episode 3, but I have to say, I like it. My original plan was Fri/Sat/Sun but I got busy Friday evening. As things currently stand it'll have be to Tuesday evening for Jedi for me. Looking forward to it though. Am I misunderstanding or did you like the added mumbling and then yelling of "No"...? Not sure those clips on YouTube few weeks back were accurate, but those were pretty awful. Maybe the low-key spoken No is bearable, but the loud one when he picks him up is terrible to me. Overview: In the spectacular final chapter of the Star Wars Saga, Luke Skywalker and Princess Leia must travel to Tatooine to free Han Solo by infiltrating the wretched stronghold of Jabba the Hutt, the galaxy's most loathsome gangster. Reunited, the Rebels team up with tribes of Ewoks to combat the Imperial forces on the forest moon of Endor. Meanwhile the Emperor and Darth Vader conspire to turn Luke to the dark side, and young Skywalker is determined to rekindle the spirit of the Jedi within his father. The Galactic Civil War culminates in the ultimate showdown, as the Rebel forces gather to attack the seemingly defenseless and incomplete second Death Star in the battle that will determine the fate of the galaxy. My Thoughts: Another I first saw in London, this time not the West End but at a preview screening at the Odeon Marble Arch. A friend worked at EMI-Elstree Studios and she got tickets to the advance screenings and took a few of us along. She also had some T-shirts and bits and pieces with the title Revenge of the Jedi on them but she wouldn't let us have those. Another excellent film with just the noted extra modification over and above that done for the Special Edition. As Jon said elsewhere the Tatooine sequences were better this time around but some of the Endor scenes looked off, maybe it is down to the Matte paintings used at the time. I think it's hard to judge the clips out of context. I heard of what the change was, but avoided seeing it. Caught up in that marvellous film, yes, I have to say I thought it worked. Unnecessary, as I said, but it makes sense in a way. what did you think Dave? I'll have to sort out my copy of the original Jedi just to compare but my feeling is that is works. From what I can remember in the original all we get is Darth moving over and you wonder if he going to assist the Emperor until he attacks him then it becomes clear he isn't. The wondering comes in as there is no visual or audible guidance to Darth because his eyes, the window to the soul, are hidden by his Dark Helmet. In this revised edition Darth shows his anguish with the cry before the attack on the Emperor giving us an audible guidance. In this revised edition Darth shows his anguish with the cry before the attack on the Emperor giving us an audible guidance. MINOR SPOILERS to follow, if you have never seen the film. If it fits in like this I could be more forgiving (not that I'm such a über-fan to begin with). The clip I saw had the loudest No after Vader had picked him up already just before throwing him down the shaft. I checked the original and S.E. versions and they were identical with no dialogue by Darth during the attacks. During the final attack on Luke by the Emperor we have Darth looking at Luke, then looking at the Emperor, then looking at Luke and saying No and finally looking back at the Emperor and the Noooooooooooooo as he goes to the Emperor and lifts him up and throws him. The looks were in the original and S.E. not the Noes. Overview: Every generation has a legend. Every journey has a first step. Every saga has a beginning... Return to a galaxy far, far away in the first chapter of the mythic Star Wars saga. Set 30 years before the original Star Wars film, Episode I introduces a young Anakin Skywalker, a boy with special powers, unaware that the journey he is beginning will transform him into the evil Darth Vader. Obi-Wan Kenobi, the wise old Jedi from the original trilogy, is a determined young apprentice and Palpatine, well-known as the evil Emperor, is an ambitious senator in the Galactic Republic. It is a time when the Jedi Knights are the guardians of peace in a turbulent galaxy and a young queen fights to save her people. In the shadows lurks an evil force waiting for the right moment to strike. With Episode I in your DVD collection, you can experience the excitement again and again. Feel the adrenaline of the Boonta Eve Podrace. Relive the intense lightsaber battles. Discover the incredible detail and breathtaking scope of this milestone in the Star Wars saga. My Thoughts: I haven't watched the prequels as much as the original so cannot really state whether there are any modifications to this film. Whilst enjoyable it doesn't come up to the levels of enjoyment I get with the original trilogy. I have to say though that it was a good film in introducing the characters and build up for the next 2 films in this trilogy to give the setting and basis for the original trilogy. 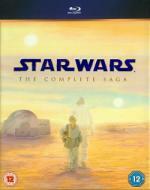 Overview: The STAR WARS saga continues on DVD with Episode II ATTACK OF THE CLONES. Anakin Skywalker has grown into an accomplished Jedi apprentice, and he faces his most difficult challenge yet as he must chose between his Jedi duty and forbidden love. Relive the adventure the way it was meant to be seen in spectacular digital clarity, including the climactic Clone War battle and Jedi Master Yoda in the ultimate lightsaber duel. My Thoughts: As I said in my review of A Phantom Menace I haven't watched the prequels as much as the originals so cannot really state whether there are any modifications to this film. Whilst enjoyable it doesn't come up to the levels of enjoyment I get with the original trilogy. I have to say though that it was a good film in continuing the character and plot development to give the setting and basis for the original trilogy.